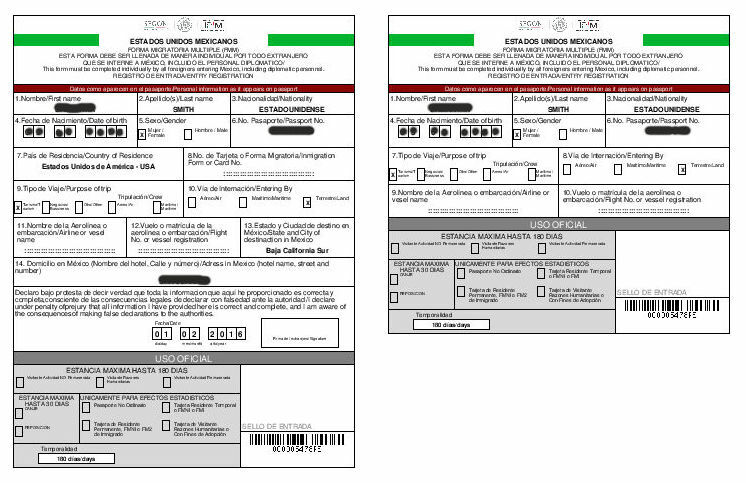 The stamped online FMM is valid for land travel throughout Mexico. After printing your FMM form, it must be stamped by INM within 30 days to be valid. The FMM is free if your trip is 7 days or less and you are traveling by land. 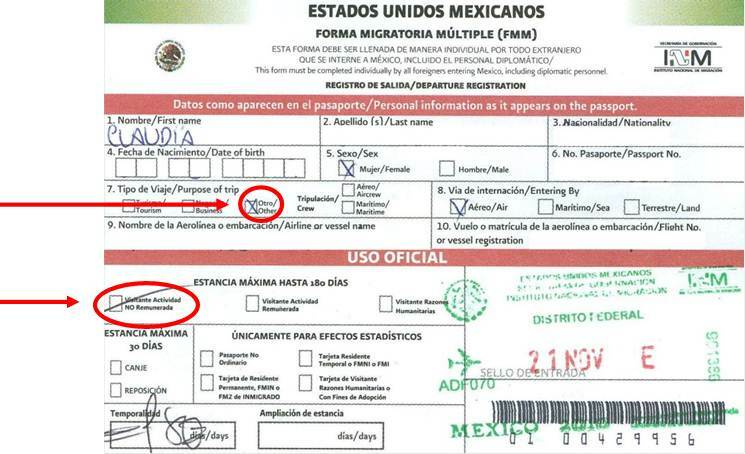 All visitors are legally required to obtain an FMM to visit Mexico regardless of the destination and length of stay. The same FMM may be used to enter and exit multiple times through any land border crossing in the state of Baja California. Therefore you may get an FMM for the maximum 180 day term available, and then use it to cross back and forth for an unlimited number of times during that period. The FMM may not be reused at ports of entry outside of Baja California, nor will you be able to reuse it for air travel from a foreign airport into any destination in Mexico. The FMM does not have to be returned to an immigration official when leaving Baja California by land. A new FMM may be issued consecutively after one expires. This means that there is no waiting period. Beginning in 2015 Baja Bound had heard intermittent reports of increased enforcement of immigration laws in the northern state of Baja California. These are mainly directed towards U.S. and Canadian citizens residing in or visiting Mexico. We understand that there may be the occasional presence of officials on federal highways asking for immigration documentation. Mexican immigration officials have also confirmed visiting retirement communities in Baja California (Norte) checking for immigration documentation. *Tip: If you receive an error for this field, be sure to check if your passport's or passport card's expiration date is after the FMM expires. To save your information and move to the next step, click the blue button: Guardar [Save info]. If you prefer to clear your information and start over, click Limpiar [Clear info]. 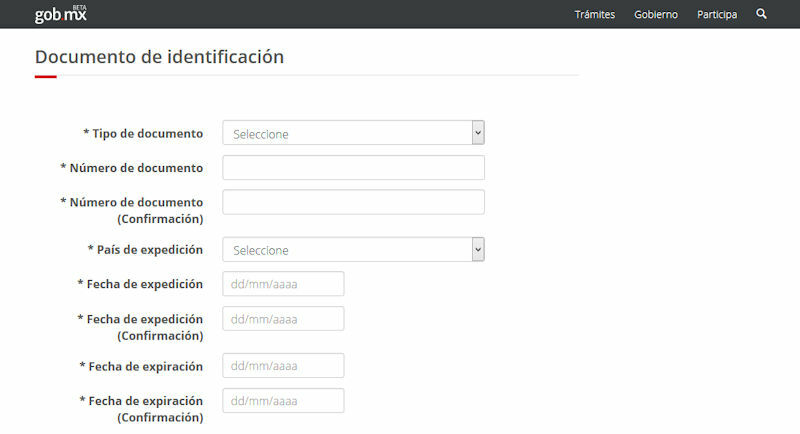 ¿Es correcta la información capturada? [Is the information you entered correct? ]: Select Sí [Yes] or No [No]. Click the blue button, Enviar Datos [Submit Information] and you will be redirected to Banjercito's website to make your FMM payment. To proceed, you must agree to Banjercito's terms and conditions. To agree, click the checkbox that reads Acepto los términos y condiciones [I agree to the terms and conditions]. To continue, press Siguiente [Continue]. Otherwise you may go back to the previous page by clicking Regresar [Back]. Review your information and click Confirmar Datos [Confirm Information] to submit. Click on Imprimir Comprobante [Print Receipt] to print a copy of your receipt. This will launch a pdf version of your receipt. 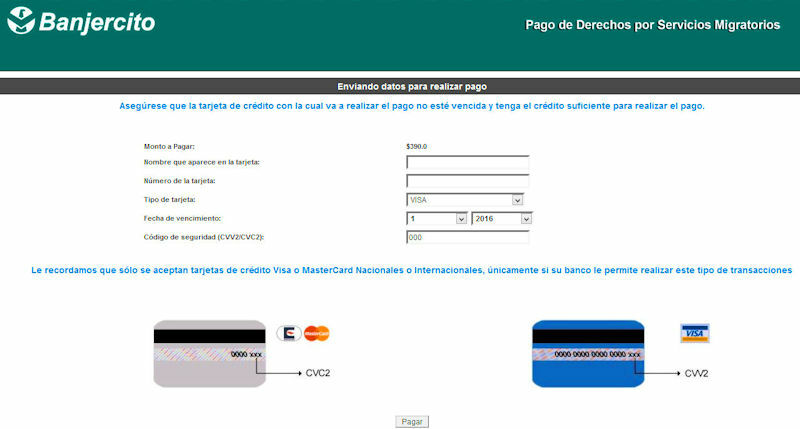 After printing your receipt, click on the new button that appears: Regresar a INM [Return to INM's website]. Clicking Finalizar [Exit] will take you back to the beginning to issue a new FMM. Step 16: Take your FMM form to the INM office at the border when you cross for the official stamp. 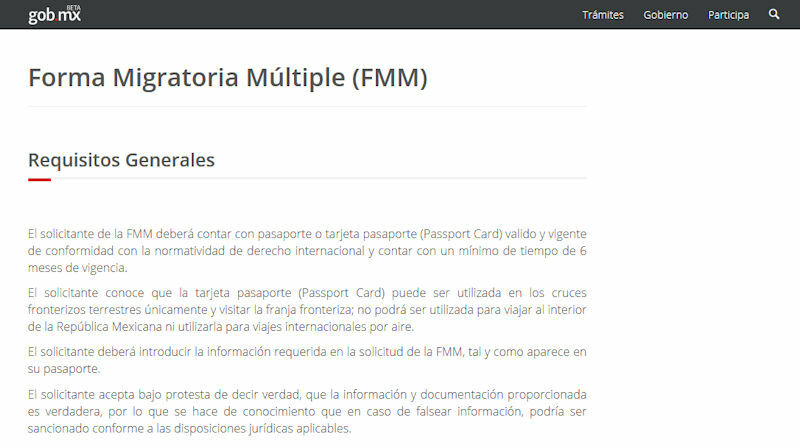 The Mexican government has recently unveiled an online application to obtain a tourist card (FMM) before crossing into Mexico by land. At this time the online application is only in Spanish, however we have created the following guide and courtesy translation into English. After filling out the application and making your payment, the tourist card (FMM) may be printed out from the convenience of your home or office. The printed tourist card (FMM) will need to be officially stamped by an INM official at the border to be valid. The FMM applicant shall have a valid and in force passport or passport card in accordance with the regulations of international law and have a minimum of 6 months of validity period. The applicant knows that the Passport Card may be used only at border crossings by land and to visit the border strip; it cannot be used to travel to the interior of the Mexican Republic or used for international travel by air. The applicant shall fill out the required information in the FMM application form, as it appears in his/her passport. The applicant acknowledges under penalty of perjury, that the provided information and documentation are truthful. Therefore, we inform you that in case of falsifying information, it may be penalized pursuant to applicable legal provisions. The Multiple Migration Form may be obtained on-line through the Institute’s website, foreigners who come into the country by land, through the places assigned to international transit of people. The applicant acknowledges that the stay status that he/she will obtain by entering the information shall be that of a visitor with no permission to carry out paid activities. The applicant acknowledges he/she is aware that the FMM has a maximum validity period of 180 calendar days and he/she will be able to use it for only one entry. 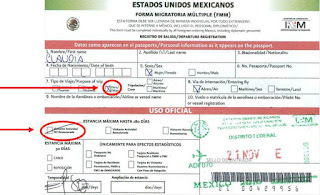 The applicant acknowledges he/she is aware that the validity of the FMM will start counting as of the stamping of the migration stamp, provided he/she qualifies to enter Mexico. The applicant will print the FMM and shall present it at the people international transit place, through which he/she wants to enter. The applicant acknowledges he/she is aware that the fee payment, to obtain the stay status, does not guarantee his/her entry to Mexico. The applicant shall present his/her valid and effective passport or Passport Card, as well as the FMM at the time of the request of entry. Agree to their terms and conditions to proceed. Important: The migration authorities can not modify any information given by the applicant, therefore, any applications that contain incorrect information will be invalid. Any errors in the issued migratory form that have resulted from incorrect information in the application will be the responsibility of the applicant. In order to submit your application, it is necessary to make the corresponding payment. Once you submit the application, you will be redirected to the Banjercito website. Now you have been redirected to Banjercito's website to make your FMM payment. At this time we do not have a courtesy translation for Banjercito's terms and conditions.